Extremely low build height with a Carbon-X® Active Heel and alignment options. 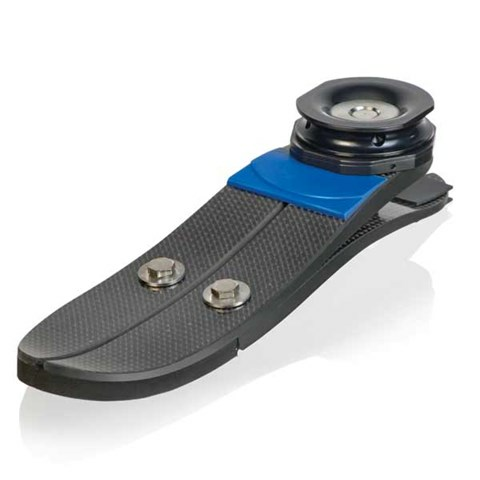 The Flex-Symes foot design is a carbon foot module connected to an actively deflecting carbon heel. The improved alignment adapter now offers angulation and adjustments in ML / AP planes. Flex-Symes is specifically designed for people with symes and pyrogoff amputations or transtibial users with long residual limbs. Warranty: 36 month limited warranty. The Carbon-X Active Heel stores the energy during loading response as the amputee transfers his or her body weight onto the prosthetic foot. Energy is gradually released from the heel providing optimal return for forward progression of the limb. Benefit: Reducing impact to the joints and residual limb thus increases comfort, reduces joint and limb damage. A split toe feature allows the foot to adjust to uneven surfaces, allowing amputees to walk with stability and comfort on uneven ground. Benefit: Helps to maintain balance, stability and reduces peak impact during loading.